Fortunately, there is another way to capture some of fines herbes’ rare and elusive goodness. Salt-drying the fresh leaves will quickly desiccate the herbs and provide you with a delicately-seasoned salt to use long after the fresh herbs are no longer available. The addition of salt dramatically shortens the drying time, while the vast surface area of the crystals and their interlocking structure help to contain and fix the fugitive flavors of the fines herbes. Obtain the fresh herbs at a good market — where they are increasingly available — or seek out herb growers in your area by asking at farmer’s markets. Better yet, try growing fines herbes yourself. French tarragon and chives are perennial plants that grow easily in any good garden soil. Parsley plants are widely available as annual plants at garden centers, while chervil is best grown from seed. Try sowing it into a prepared bed in late fall. Winter temperatures act on the seeds to yield better germination and healthier, more flavorful plants the following spring. Use the herbs immediately after you bring them home (or harvest them), and avoid bruising or washing them too vigorously. If there is any dirt or sand present, give them a gentle dunk in clean water and then spin them dry using a salad spinner. Next, gently remove the leaves from the stems. Use a sharp knife or scissors to cut the chives into shorter, more manageable pieces. 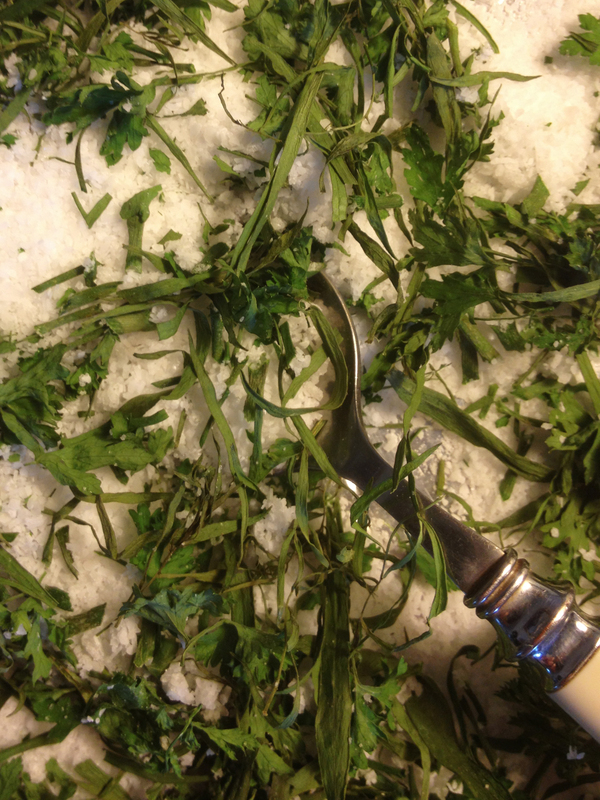 Spread the herbs over the salt, then add another sprinkling of salt over them. 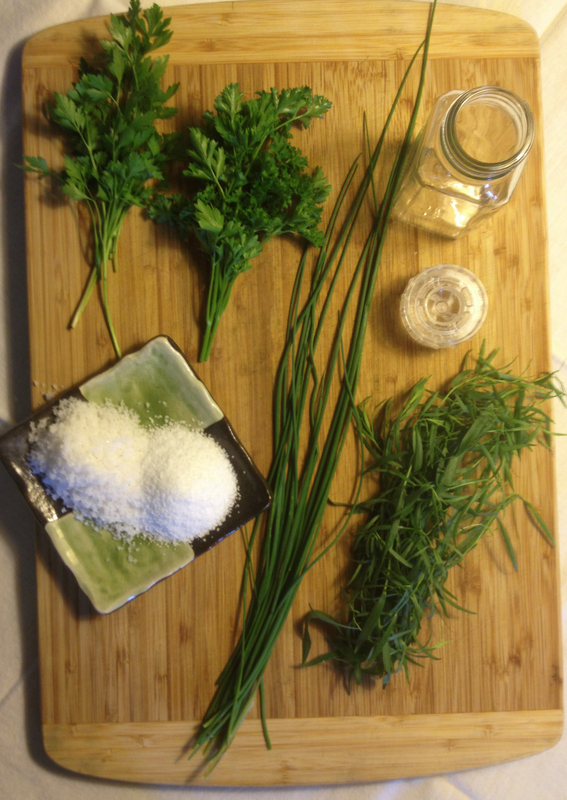 Use an approximate ratio of 3 parts salt to 1 part herbs as a guide. Place the herbs/salt mixture in an oven or toaster oven pre-heated to 150-200 degrees. (A convection oven works best.) Dry the herbs. It should take just 20-30 minutes; time may vary according to your oven’s performance. Gently stir the mixture once midway through to ensure even drying. 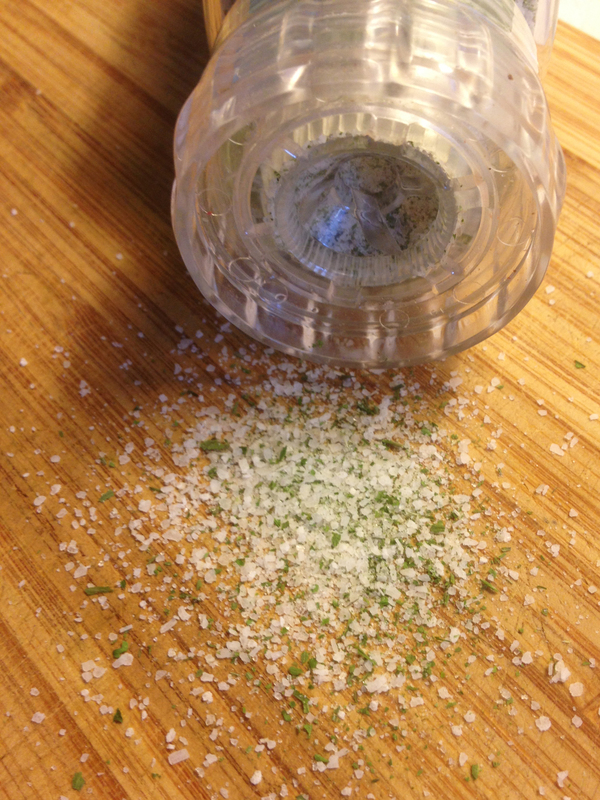 Store your finished salt-dried fines herbes in a dark, dry cupboard. Use within 4-6 months. Sprinkle on eggs, especially poached eggs, or eggs that are cooked soft. Season any creamy, silky sauce such as Hollandaise, Béarnaise, Béchamel or Mornay. Season any dish that calls for delicate white fish, shellfish or bivalves such as clams, oysters, mussels, and scallops. Use it on poultry — fines herbes works especially well with chicken and turkey. Try adding the unique flavor of fines herbes salt to scooped salads such as egg, potato, crab, shrimp and chicken salad. Mix with plain, unsalted, fresh creamery butter and serve over boiled or mashed potatoes, steamed vegetables (asparagus…YUM!) or leafy greens. Give as a unique, handmade gift! This entry was posted in In the kitchen and tagged DIY, fines herbes, herbs by Cayenne Room. Bookmark the permalink. I really look forward to trying this method especially with Cilantro. It is so abundant now coming in faster than can be used. Thanks!